When you’ve moving heavy or fragile equipment, the last thing you need is a forklift with rough starts and stops. And when you’re working in smaller facilities, a bulky forklift becomes a problem. The Versa-Lift was developed in 1994 as the ‘ideal moving machinery’ forklift. Hydrostatic drive: The hydrostatic transmission outperforms mechanical, electrical and gear options because it has a smooth power curve with no peaks or valleys in performance. With hydrostatic drive, you can increase torque with no gear shifting required. You’ll get faster response and more controlled speed regardless of load. Two-speed transmission: The Versa-Lift’s two-speed transmission offers more torque at lower speeds, and increased acceleration and power when needed. Extendable frame: This unique feature increases the versatility of the Versa-Lift. With the base retracted, the Versa-Lift can move loads up to 40,000 pounds. When the frame is extended, lifting capacity is up to 60,000 pounds. Hydraulic boom attachment: You’ll gain crane capability and vertical lift to 26-feet with the telescoping boom attachment. The horizontal boom includes a swiveling lifting eye to prevent load rotation. Direct lift mast: The Versa-Lift has a two-stage hydraulic lift cylinder. This provides smooth performance without mast chains, which can elongate, break or fail when pins twist. Removable counterweights: When heavier loads need a counterbalance weight to prevent tipping, the Versa-Lift can be fitted with up to three counterweights. The team at NessCampbell Crane will calculate the weight needed and follow all guidelines for safe connection. Being able to remove the counterweights lowers the weight (and cost) of transporting the Versa-Lift to sites. Remote control accessory: Versa-Lift offers an optional wireless remote control, giving the operator the ability to run all functions of the lift with external visibility. Use of the remote control can reduce the manpower needed to move machinery. 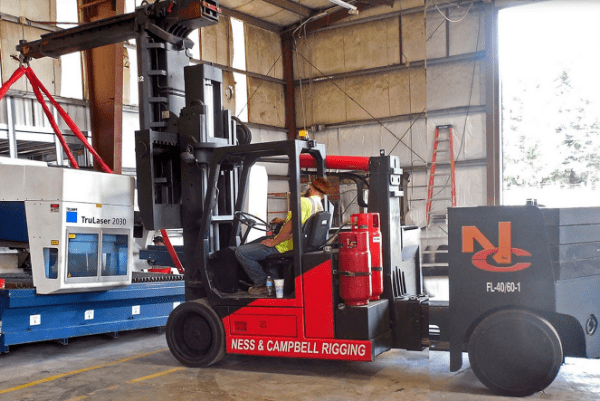 Contact our team at NessCampbell to discuss your heavy machinery moving project. We’ll get the work done safely, efficiently, and on time, while managing risk.